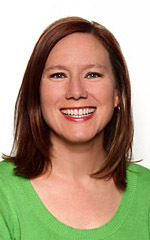 The real challenge to recording food intake is figuring out how much food or drink was actually consumed. One of the main sources of error in a food log is inaccurate portion size. When we don’t measure our portions, we almost always underestimate how much we really eat. This is why so many of us struggle with weight loss, even if we are tracking calories. Measuring is much more accurate than guessing. 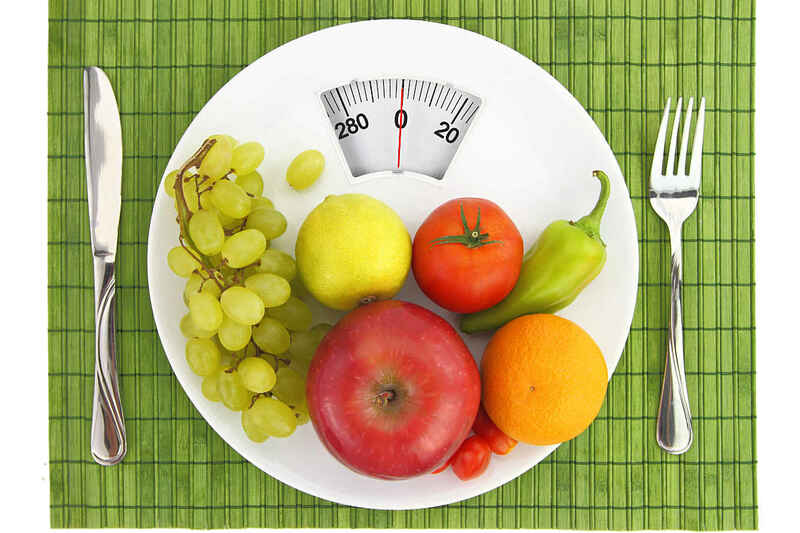 The more frequently you measure, the better you will be at guessing portion size when measuring is not possible. This is especially helpful when you go to parties, dine out, or when you travel. Weighing is typically the most accurate way to measure portion size. Food labels use weight for nutrient content, even if a volume measurement is provided. For example, breakfast cereals list the serving size in cups but they also include the weight of that serving size. Use a digital kitchen scale to weigh foods - this will be more accurate, faster, and easier to use than an old-fashioned spring-loaded scale. With a digital scale, you can easily zero out the weight of the container as well as select different units of measure (e.g. grams, ounces, etc.). Digital scales can be bought online or from local stores that sell kitchen and cooking related products. There are many affordable brands available. Sometimes we don’t have a choice in how we measure food items. For instance, the serving size on a food label for oils and beverages might be listed as a volume (e.g. cups, fl oz, ml, etc.) without a weight. In that case, you need to know how to measure volume. Buy two sets of measuring cups and spoons. That way, you always have one clean and ready for measuring. When measuring a liquid, it is easier, more accurate, and less messy if you use a measuring cup designed for liquids. 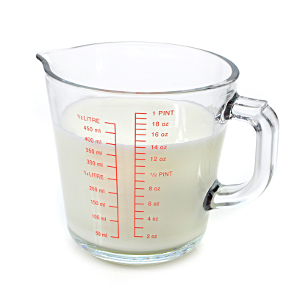 See below for an example of this type of measuring cup. When measuring the volume of a solid (e.g. flour, cereal, etc. ), you can use standard measuring cups (if measuring weight is not an option). Level off the contents with the flat side of a knife to get an accurate measurement. Use metal or plastic measuring cups - whichever you prefer. 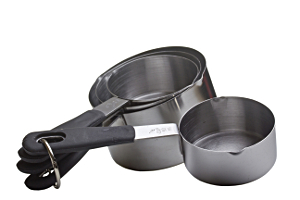 Standard measuring cups look like those shown in the photo below. 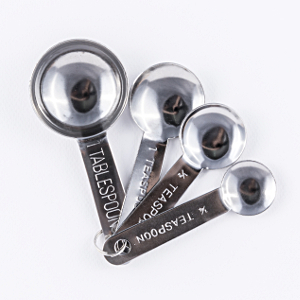 For measuring very small amounts of liquids or solids, you can use measuring spoons. Level off solids with the flat side of a knife. Use metal or plastic measuring spoons - whichever you prefer. They look like the ones shown in the photo below. Let’s be honest. If you consume foods straight out of the original packaging, then you have no idea how much you have eaten unless you eat the entire package. Just say “no” to this behavior. Portion out what you want, log it, and then enjoy it. I have saved myself hundreds of calories by implementing this simple rule. I have made a list of foods that I tend to overeat unless I carefully portion control ahead of time. Make up your own list of items and post somewhere near the food - on the fridge or maybe on the kitchen counter. Food labels typically display serving size as consumed, but not always. There are many exceptions that make logging a little bit tricky. Here are some tips that will help you improve your logging accuracy. MyNetDiary uses the USDA National Nutrient Database as the foundation for the food item file. If you visit the USDA database, choose “Standard Reference” under “Select Source” - this will allow you to search basic or generic foods to find equivalent weights and measures, check to see if there is a cooked version available, and check how food items are worded if you can’t find them in MyNetDiary. If you eat a food that is cooked, then ideally, log the cooked generic version of the food item. Doing so will give you the most accurate calories and nutrient content. Pasta and rice. Food labels typically display 2 oz dry, which makes close to 1 cup cooked (about 220 calories). USDA has a number of cooked pasta and rice options so I would choose one of those unless you use a flavored convenience product. Oatmeal and other cooked cereals. Food labels typically display the dry weight and/or volume that corresponds to 1 cup of cooked product (about 160 calories). USDA has cooked generic versions so use those unless you use a flavored convenience product. Meats, fish, and poultry. Most meats shrink about 25% with cooking. For example, if you started with 4 oz raw ground beef, then the actual cooked weight of the patty is closer to 3 oz. Food labels, if available, typically list raw weight. But USDA has many cooked versions of various meats so use one of those unless you use a flavored convenience product. Fresh fruit. For fruits with edible skin, there are food items with and without the skin so choose the one that you consume. For bananas, peel the banana, then measure the weight to be consumed. If you can’t measure the weight, then measure the length and find the closest description (small, medium, etc.). Tip: add “raw” to your name search to find basic fresh fruit or vegetables. The measurements provided in the table below might be helpful when logging. If you have already started recording your intake, then you know how difficult it is to estimate portion size. For restaurant chains, the nutrition information should be posted on their website. For other restaurants, you might have to guess if your server does not know the portion size. For more help on estimating portion size when you cannot measure, check out the Serving Size Card from the National Heart Lung and Blood Institute. This card displays portion size using familiar objects. Also visit WikiHow’s How to Estimate Portion Size for more helpful visual representations of portion size. See below for a quick summary. Tip: We tend to serve ourselves more food when we use larger dishes and less food when we use smaller dishes. If you are trying to lose weight, consider using smaller plates and bowls if you are not able to measure your portion size. If you need help figuring out how to log a food item, or just have questions about nutrition, weight, or diabetes, post us a question at “Ask a Registered Dietitian” forum in Community. We would love to help you.